Tigers﻿ are amazing animals. The second biggest cat in the world the tiger is also one of the most feared. The tiger is also a water loving cat. Some tigers even have webbed feet for swimming. 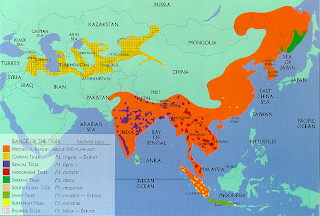 The Caspian tiger was feared so much that people hunted them to extinction. Most people regretted making them extinct so much that we are now trying to save their living relatives. The closest living relative to the Caspian tiger is the Amur tiger (or Siberian tiger). 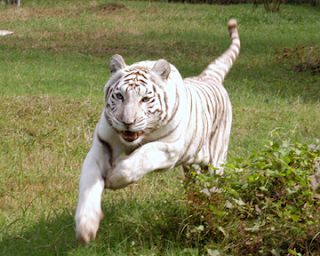 White tigers are an example of a false conservation advertisement. White tigers are not found in the wild and all white tigers are inbred and hybrids (a cross with a Bengal and Siberian tiger). White tigers are also always born with birth defects like: cleft pallets, club feet, back problems, and deformed internal organs. All white tigers are also born cross eyed (wither they show or not) which means that the optic nerves are wired to the wrong side of the brain, this also means that white tigers don't have depth perception. 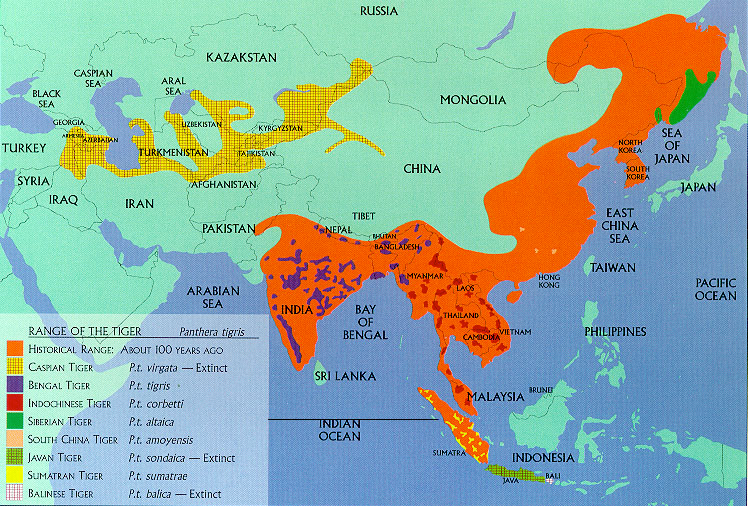 The tigers range is very small now, and it's only getting smaller due to deforestation, hunting, and poaching. Hear comes the fastest land mammal, it's the cheetah. 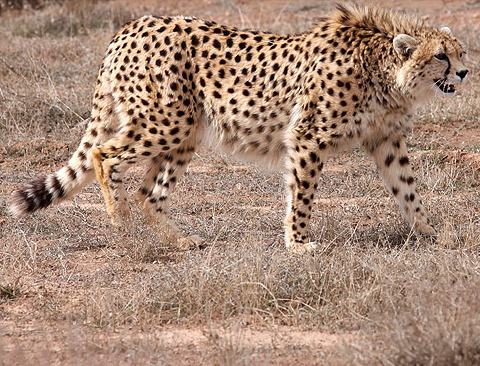 The cheetah can run up to 72mph in a short burst of speed. unfortunately the cheetah often get their pray stolen from other predators like lions, hyenas, leopards, and birds of pray. You probably think this picture is fake right? Well you're wrong. This is the King cheetah. When it was first discovered people thought that it was a separate species, but now it is recognized that it is a color morph (mutation) within the same species called Melanism. Melanism is the opposite of Leucism in that black shows up where it's not suppose to be. Scientist were stunned to see that some cheetahs live in family packs. This pack behavior is mostly done by male cheetahs who are brothers but sometimes (though rare) females form packs with their siblings too. These cheetahs have learned that they can hunt bigger pray in a pack then being. The only other big cat that does this is the lion only more complex. 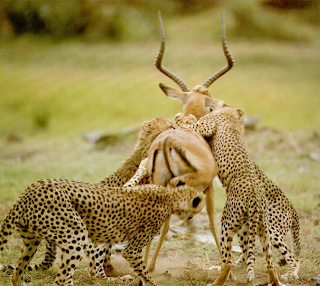 Unlike what most people believe cheetahs do hunt more then gazelles. They also hunt baby (adults when in packs) wildebeest and zebra, adult impala, springbok, guineafowl, and hares are also hunted by cheetahs. The Asiatic (A-she-at-ic) cheetah is a subspecies of cheetah that is now only found in Iran. The Asiatic cheetah differs from the African cheetah in that it is slightly larger, has a thicker coat (more mane and longer fur on the belly), and is slightly stockier. 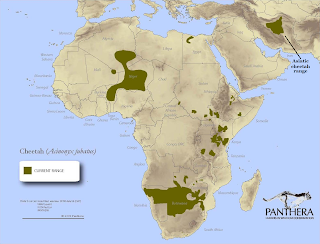 The Asiatic cheetah also hunts different prey then the African cheetah, they hunt: Jebeer gazelle, Goitered gazelle, wild sheep, wild goat, and cape hare. Both the African and the Asiatic cheetahs range. 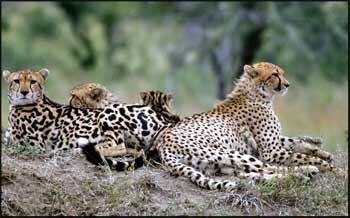 The cheetah is endangered due to over hunting, habitat loss, and live stalk crowding out prey.